TRP Aftermarket Parts announces the availability of a new line of quality exhaust mufflers, pipes and clamps for different configurations and different budgets. With its new exhaust program, TRP(R) offers aluminized and chrome-plated tubes, Y-pipes and stacks, plus premium flex hoses in a variety of materials and pre-cut sizes. The stacks also come in a range of lengths and configurations, including straight, west coast, curved and monster in both 4-inch and 5-inch diameters. The TRP exhaust program offers operators a choice of good, better and best models of mufflers. All three models meet OEM back pressure specifications and offer internal support flanges on inlets and outlets to ensure long life. For operators who need a quieter muffler, TRP offers a premium muffler that reduces the noise level by up to five decibels compared to the performance of its standard muffler. And for customers who need a muffler with low restriction for use on trucks with higher horsepower engines, TRP offers a top-of-the-line muffler that reduces the noise level by up to another three decibels as compared to the better model. 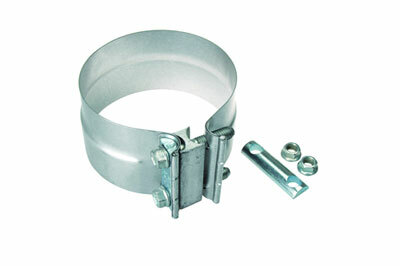 The clamps offered through the TRP exhaust program use 304 stainless steel bright material and bands with pre-attached hardware with force bars, nuts and reaction blocks to eliminate tearing on installation. A stepped band design for lap joints provides fast, accurate installation and a better seal. The program offers customers a choice of good, better and best clamps to match their operating needs and budgets. TRP’s best clamp comes with a pre-formed band and heat-resistant gasket material. The gasket improves the clamp’s sealing capacity by more than 50 percent over the performance of a standard stainless steel clamp with a flat band. TRP Aftermarket Parts for commercial vehicles are available through a network of authorized retailers that include Kenworth, Peterbilt, and DAF dealerships around the world. From dump trucks to cement mixers, delivery vans to tractor trailers, school buses to transit buses, TRP offers reliable aftermarket products that are designed and tested to exceed customers’ expectations regardless of the vehicle make, model or age.